Reverend A. J. Dyck of the Hoffnungsau Mennonite Church, Inman, Kansas, wrote this letter to Governor Arthur Capper of Topeka, Kansas, concerning the Third Liberty Loan drive and its impact on the German American community. Dyck explains that the members of his church have bought more than the amount of Liberty Loans required by the established quota in order to prove their loyalty and avoid harassment by "mobs." In addition, Dyck asks Capper if it would be acceptable for members of his church to donate to the Red Cross rather than providing money to support the war effort. 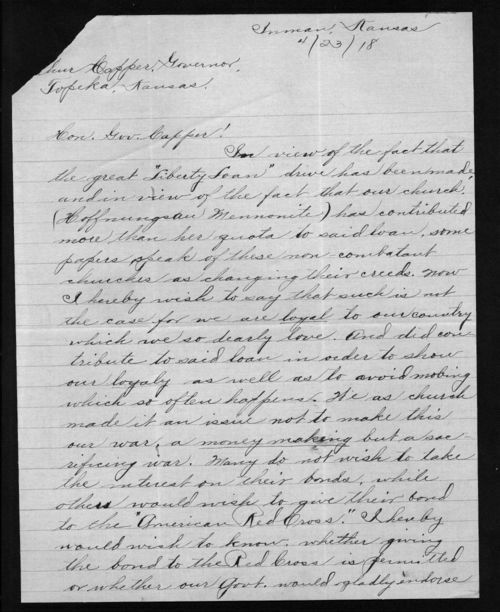 Dyck's letter to Capper can be used to help students understand the predicament that many German Americans in Kansas faced during World War I. In particular, the letter clearly states the difficulties that Mennonites, who did not advocate violence, dealt with during the conflict.